IF YOU THINK HAIR COLOUR IS NOT FOR YOU, THINK AGAIN. Imagine five beautiful shades of colour and that too, with the grey coverage that you have always dreamt of. We have them right here. But that’s not what makes our crème really special. Here’s our secret- it is enriched with aloe vera and milk protein conditioning formula. No wonder then, it makes your hair so incredibly soft. This gets even better, our crème doesn’t contain ammonia; so it saves your hair from all that damage. Our Crème comes in pre-measured sachets. That means no more calculations. We have everything in the perfect proportion. All you need to do is just mix, apply and rinse. It is really that simple. The proteolytic enzymes in Aloe Vera eradicate dead skin cells from the scalp, promoting hair growth and preventing hair fall. The healing and soothing properties of Aloe Vera also provide relief to those with a sensitive scalp, prone to irritation, which might occur after colouring the hair. Godrej Expert Rich Crème Hair Colour, with the goodness of Aloe Protein, nourishes your hair as you colour it, making it soft and shiny. What is 40% of a 24 ml tube? Hang on, hair colouring doesn't need to be a complicated math problem. Our crème comes with two simple pre-measured sachets - a colourant and a developer. No need to measure. Just cut, fully squeeze and mix. So easy, quick and perfect that it will make you go, "Oh my God!" Mix equal quantities of crème and developer (1:1) in a plastic or glass bowl. Apply the mixture on washed and dried hair with a brush. Leave it for 30 minutes and then rinse your hair thoroughly with water. 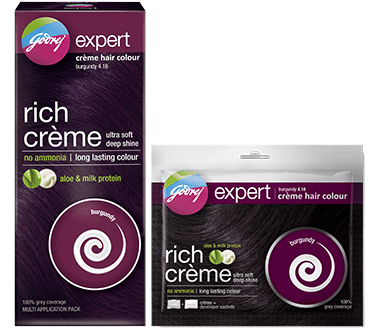 How does Godrej Expert Rich Crème Hair Colour keep my hair soft and silky? Unlike other crème hair colours that contain ammonia, Godrej Expert Rich Crème Hair Colour has milder colouring ingredients. These ingredients ensure no damage* to your hair proteins and as a result, keep the strength of your hair intact. It also contains an aloe vera and milk protein formula with in-built conditioners that condition your hair while colouring. 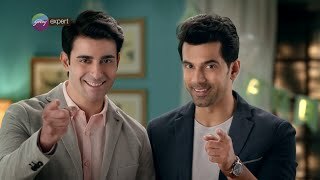 How many shades is Godrej Expert Rich Crème available in? I have some colourant and developer left from the sachet after one use. Can I re-use them? The contents of our sachets are designed to ensure a perfect one-time colouring experience. We advise that you use the entire contents of both sachets, so as to get the mix right. Also, as the colourant comes in contact with air, it starts losing its ability to colour and so, we discourage to re-use the sachet. How do I use Godrej Expert Rich Crème Hair Colour at home? 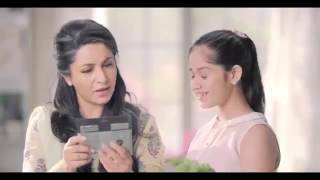 Using Godrej Expert Rich Crème is extremely easy. Select a shade that you like best from our shade card. Do a skin hypersensitivity test 48 hours before application Your hair must be clean and dry before application. Always wear gloves. If you’re using the single-use packs, cut open the pre-measured sachets and mix them in a non-metallic bowl. Section your hair and start applying the colour with a brush, from root to tip. Leave it on for 30 minutes and then rinse it thoroughly with water for beautiful, soft hair. If you’re using the Multi-Application Pack, mix equal quantities of crème & developer (1:1) in a non-metallic bowl. Apply the mixture on your hair with a brush, leave for 30 minutes and rinse thoroughly with water. Gently massage the conditioner into the lengths and ends of rinsed moist hair, leave for 3 minutes and rinse well with water. How does Godrej Expert Rich Crème deliver the colour, despite having a 'No-Ammonia' formulation? Ammonia, in hair colour, bleaches the hair and causes the strands to swell to offer better colour. That's why a lot of hair colours contain ammonia. However, that is not a good idea. Ammonia is very harsh on hair. Not only does it smell unpleasant, but it can also damage the hair. The harsh chemical effect of ammonia reaches as deep as the proteins in the cortex of your hair. So each time you use an ammonia-based hair colour, it can make your hair more lifeless and brittle and could also lead to reduced hair strength; in short, weak hair. At Godrej Expert, we use milder base ingredients to lighten hair, as well as activate the colouring action, thus resulting in soft, silky and vibrantly coloured hair. 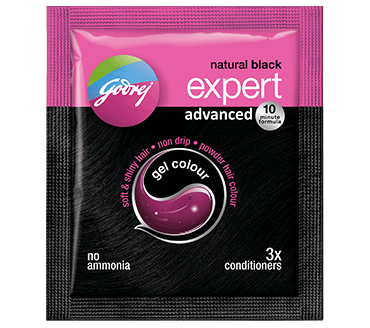 I was earlier using Godrej Expert Powder Hair Colour. Which Crème shade should I now use? 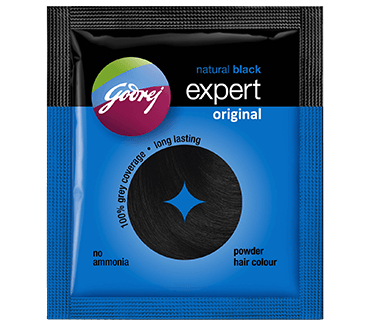 The shade closest to Godrej Expert Powder Hair Colour (Original) is Godrej Expert Crème Natural Black (1.00). However, if you want a softer black, you could try our Black Brown (3.00). When you use Black Brown in the first application, it may still appear black. This would be due to the effect of your previous colour. The real colour will start showing with subsequent applications. Millions of people around the world safely use hair colours regularly. However, in rare cases, allergy from hair colour products may develop at any time and at any stage in life, like many other food items we commonly know of. Hence, a skin hypersensitivity test is strongly recommended before every application of hair colour as a precautionary measure, even for regular users to ensure safe and pleasurable hair colouring experience. All safety instructions and precautions are mentioned on the pack in detail. The skin hypersensitivity test must be done 48 hours before application on the hair. To conduct the test, cleanse a small area of skin behind the ear or inner surface of the forearm using soap and water or alcohol. Mix a small quantity of colourant and developer, apply on previously cleansed skin and allow it to dry. Keep the product on for 48 hours and observe. If there is no reaction such as reddening, burning, itching, irritation or swelling in the area that the test was conducted the product can be safely used for hair colour application. 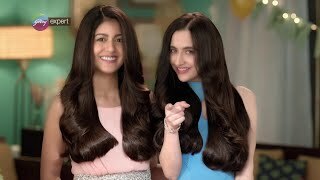 Which Is The Best Hair Colour For Indian Hair?